High Quality Wood Pellets Come in All Sizes and Colors! The appearance of quality wood pellets is as varied as the many different species of trees. You may see a variety of colors, from pale blonde to warm brown, depending on the species of wood. While color doesn't guarantee quality, typically pellets with a light blonde color are of higher quality than darker pellets. The one big exception to this rule are pellets produced from douglas fir materials. In this case the pellets are slightly red in color and represent some of the best wood pellets on the planet. Beware of pellets that are very dark in color. Wood pellets should generally not be darker than a cup of black coffee. 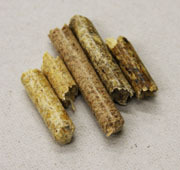 An excessively dark color may indicate that bark was mixed into the manufacturing process, and those pellets will likely have high ash content. All wood pellets have a uniform diameter, but length can vary from 0.25 to about 1.5 inches. Most pellet stoves will work just fine within this normal range. But if longer pellets are causing your stove problems, here’s a handy tip: drop a bag of pellets on the ground once or twice to break down the length before loading the fuel into your stove. Wood pellets are condensed to about 40 lb/ft2 to ensure a consistent burn. Pellet stoves are so efficient because the fuel is uniform. But there is a natural (and perfectly acceptable) variance in the density of pellet fuel. 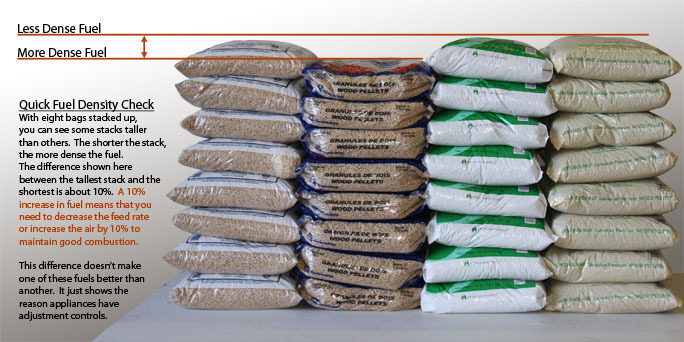 Density may vary slightly by brand or even by bag, but you can be confident that all of our manufacturers have committed to producing a consistent, high quality pellet.